Eddy current testing is a noncontact method used to inspect nonferromagnetic tubing. This technique is suitable for detecting and sizing metal discontinuities such as corrosion, erosion, wear, pitting, baffle cuts, wall loss, and cracks in nonferrous materials. Two coils are excited with an electrical current, producing a magnetic field around them. The magnetic fields penetrate the tube material and generate opposing alternating currents in the material. These currents are called eddy currents. Any defects that change the eddy current flow also change the impedance of the coils in the probe. These changes in the impedance of the coils are measured and used to detect defects in the tube. Four simultaneous frequencies per input. This feature allows for inspection speeds up to 2 m/s with four frequencies on absolute and differential channels, without signal distortion. No separate external reference probe is required for absolute channel operation. 4 ECT inputs and up to 64 multiplexed channels. 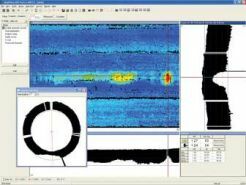 The MultiScan™ MS 5800E can support a large number of ECT channels to perform array probe inspections. Compared to single-channel inspection, the array probe technology allows for faster and easier surface coverage. The ultrasonic IRIS option is used to inspect a wide range of materials, including ferrous, nonferrous, and nonmetallic tubing. This technique detects and sizes wall loss resulting from corrosion, erosion, wear, pitting, cracking, and baffle cuts. Olympus digital IRIS inspection technology is used extensively as a prove-up technique for remote field testing, magnetic flux leakage, and eddy current inspections. Simplifies equipment calibration for different tube diameters and materials. The wizard also generates the reporting code for the inspection. UT settings can be modified during the C-scan acquisition for quick optimization of signal detection. Reduces missed flaws with C-scan displays. To enhance the quality and appearance of your reports, include color maps and cross-section views of defects. Used to analyze data off-line, and to assess results with customers. Remote field testing (RFT) is being used to successfully inspect ferromagnetic tubing such as carbon steel or ferritic stainless steel. This technology offers good sensitivity when detecting and measuring volumetric defects resulting from erosion, corrosion, wear, and baffle cuts. Olympus remote field probes and the MultiScan™ MS 5800 are used all around the world to successfully inspect heat exchangers, feedwater heaters, and boiler tubes. RFT with up to four different frequencies and real-time mixes. This feature provides more flexibility for mixing and defect validation. The detection and sizing of flaws at the support plate is made easier with multifrequency inspections and dual-driver operations. RFT with frequencies ranging from 20 Hz to 250 kHz. The high frequency available with the MultiScan MS 5800R™ extends RFT inspection to thin materials with low permeability, such as 400-series stainless steel, and other ferromagnetic alloys. Near field testing (NFT) technology is a rapid and inexpensive solution intended specifically for fin-fan carbon-steel tubing inspection. This new technology relies on a simple driver-pickup eddy current probe design providing very simple signal analysis. NFT is specifically suited to the detection of internal corrosion, erosion, or pitting on the inside of carbon steel tubing. The NFT probes measure lift-off or "fill factor," and convert it to amplitude-based signals (no phase analysis). Because the eddy current penetration is limited to the inner surface of the tube, NFT probes are not affected by the fin geometry on the outside of the tubes. Magnetic flux leakage (MFL) is a fast inspection technique, suitable for measuring wall loss and detecting sharp defects such as pitting, grooving, and circumferential cracks. MFL is effective for aluminum-finned carbon steel tubes, because the magnetic field is almost completely unaffected by the presence of such fins. The universal connector supports all standard differential and absolute bobbin, impedance, transmit-receive, and rotating probes. True electronic probe balancing. A separate external reference probe is not required for absolute channels. Supports any differential and absolute probes with a single exciter, dual exciters, dual pickup, near field, and magnetic flux leakage.